“It feels like home,” said Julia Oseka, 17, exuding Nazareth joy and excitement during a recent visit to the Provincialate in Des Plaines, IL. An international student with the Global Outreach Catholic Exchange Program, Julia previously attended Nazareth’s Gimnazjum (middle school) in Warsaw, Poland and has spent the last 10 months at Roncalli High School in Manitowoc, WI, a town on the shores of Lake Michigan about three hours north of Chicago. Julia contacted Sr. Angela Szczawinska, CSFN, in Des Plaines at the urging of Sr. Michalina Pawlak, CSFN, in Warsaw. 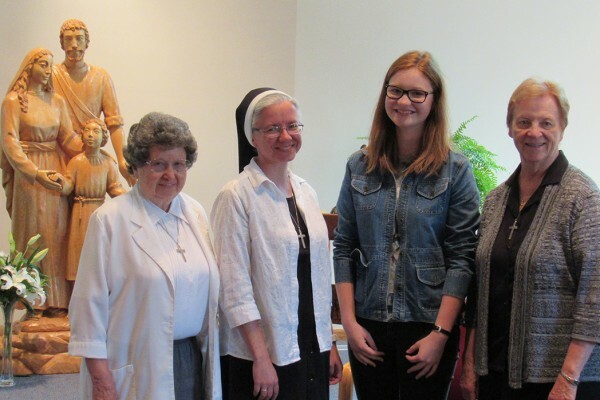 In an email to Sr. Angela, Julia introduced herself as “one of the ‘Nazareth Girls’” who had spent three years at the boarding school in Warsaw run by the Sisters of the Holy Family of Nazareth. Arriving at the Provincialate with her host Dad and her American friend, Julia toured the Provincialate and spent time talking with Srs. Angela, Virginette Rypniewski and Elizabeth Jean Ronkowski and telling them about her experiences as student in Poland and in the U.S. Though she learned a lot during her time at Roncalli High School, she noticed that her fellow American students seemed less serious than the Nazareth girls in Poland and sometimes less respectful, noting that in Poland students are expected to stand when the teacher enters the classroom. She did, however, appreciate that U.S. teachers are so welcoming and attentive to students’ needs. “The ways are just different,” she said. At home in Warsaw, Julia is involved with Nazareth youth ministry, where she has developed many “beautiful” friendships with CSFNs in Poland. “I fell in love with the Holy Family and this community,” she said. While she has tremendous love and respect for the Sisters of the Holy Family of Nazareth’s charism and mission, no, she does not see herself entering religious life. With a few more years of study still ahead of her in Poland, her interests right now are leaning toward studies in physics and music.